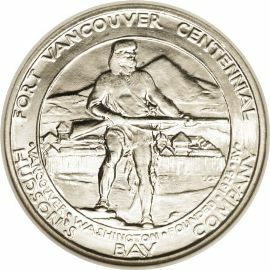 The 1925 Fort Vancouver Centennial Half Dollar was created to commemorate the 100th Anniversary of the founding of Ft. Vancouver Washington, by the Hudson Bay Company. Proceeds from the sale of these coins went to finance centennial events. The centennial celebration began on August 17th, 1925 and was a week-long event. As a publicity stunt, to increase sales, the entire mintage of these coins was flown from San Francisco to Vancouver Washington and back the same day. The flight was claimed to be the first ever, but based on actual distribution, it doesn’t look like the stunt worked to increase sales. A bust of Dr. John McLoughlin is displayed prominently on the obverse of the coin with his name inscribed below. 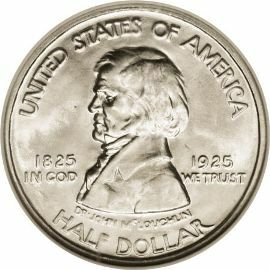 The other inscriptions read “UNITED STATES OF AMERICA”, IN GOD WE TRUST”, the denomination “HALF DOLLAR”, and it also include a split date of “1825 – 1925”. Dr. John McLoughlin also known as the “Father of Oregon” was a very influential person during the settlement period of the Pacific Northwest. McLoughlin was born a Canadian in 1784, married Marguerite Waden McKay in 1812, had four children and died in 1857. McLoughlin was sent in 1825, by the Hudson Bay Company, to create a headquarters and be a contact for the fur trade in the region. He did this and since then he has been honored several ways including having a 9,000 foot mountain named after him in southern Oregon. He has also had roadways, schools, and even a Boy Scout Camp named after him. The reverse depicts a trapper with a buckskin suit. He is holding a musket in his hands and has Fort Vancouver, the Columbia River and Mount Hood in the background. The inscriptions on the reverse of this coin read “FORT VANCOUVER CENTENNIAL”, “VANCOUVER WASHINGTON” and “FOUNDED 1825 BY HUDSONS BAY COMPANY”. Another interesting fact about this coin is that they were struck at the San Francisco Mint but the “S” mintmark was left off by accident. Circulated examples of this coin are common as are third party graded coin up to about MS-64. Higher than that, they become very rare. As with any of the classic commemoratives, grades above MS-66 are extremely rare and valuable. Most of these coins are well struck with good luster. When grading this coin for wear, the high points are McLoughlin’s hair, shoulder and temple on the obverse and the trapper’s right knee on the reverse.